This post is concerning the best dog in the world, Bandit, who we had to put down several days ago because he was getting very old. He has been losing hair for a while, his eyes were leaking brown stuff, and the vet told us he had cancer. Several months later though we were told he didn't have cancer, just skin allergies or something. He still had lost a lot of fur and wouldn't be able to last the winter. We also got a new puppy, and we didn't want him teaching her bad habits. We buried him under a apple tree out back. In as bad of shape as he was, he was still in really good shape, he could run like it is nothing and would never miss a chance for a car ride. He ran along, hoping to get in the car not knowing it was his last trip to the vet. A bunch of small shorebirds in Churchill, I am not sure what they are. Maybe Sanderlings??? Please help me with the identification. Now for the W.W.B.W. Can you guess what this bird is? Leave a comment below, even if you are not sure what it is. Can you guess the bird below? Last times birds were Great-horned Owl, Blue Jay, Black-billed Magpie, American Crow and Common Raven. My brother made a temporary title for my blog with some of the Churchill pictures. If you want to know all the birds we saw, look on the Churchill Bird Trax I temporarily put up. The first day we set out at 5:30 AM in the car for Thomson, where we would take the train at 5:30 PM to Churchill. Since we were up so early I was able to get pictures of the sunrise while we were driving. We stopped at Pisew Falls on the way and had lunch, there was a boardwalk around the impressive falls. 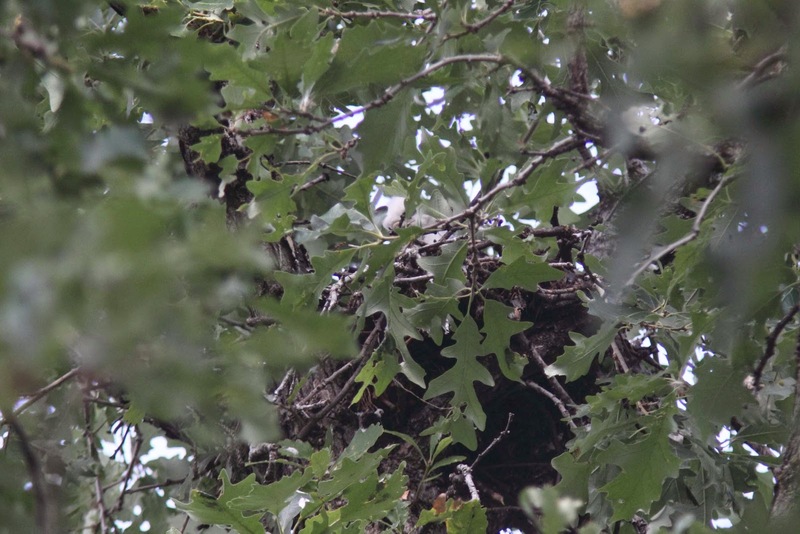 When we were on the road again, we stopped so I could take a picture of an Osprey on a nest. After an 18 hour ride on the train, we arrived on a misty morning in Churchill. We were planning to take a picture of our family in front of the sign but we decided to wait until after we settle into the hotel. The first birding we did was at the Granary Ponds, where I got 7 lifers I think. The first being Arctic Tern, which greeted us as soon as we stepped out of the rented van by dive bombing us and bombing us. I spotted the egg that it was so feircly guarding. Until after we got home I didn't know we had saw a Green-winged Teal, I photographed this family thinking they were mallards, but after looking at the picture, I spotted the green wing. On of the lifers was Short-billed Dowitcher, I spotted them across the ponds. We saw a Red-breaster Merganser Hooded Merganser sitting on the water. I believe the bird below is a Lesser Yellowlegs, please correct me if I am wrong. Here is a picture of lots of the birds in the pond, American Black Ducks (lifer), Mallards, Red-necked Phalarope (lifer), Arctic Terns and Herring Gulls were the bulk of the birds in the pond. The rest of the day was spent driving around Churchill, birding and looking for bears. We went to Cape Merry and saw some Whimbrels (lifer! ), as well as a dying bear across the river. There were also a lot of Sandhill cranes, apparently attracted by the grain from the grain from the trains. I believe this is a Stilt Sandpiper Lesser Yellowlegs, though I am not 100% sure, please correct me if I am wrong! Stay tuned for the next day of Churchill!!! This might be a bit off topic, but we got a new puppy last night! It is a mix of Golden Retriever and Golden Lab. Our other dog, Bandit, is getting very old, he is 14. He was losing hair and we were told he was dying of cancer, but now the vet says maybe not, it could just be allergies. We think we are going to name the new puppy Winnie, but we aren't 100% sure yet. We're just about to leave to the Big Whiteshell to go camping for a couple days. Unfortunately I will miss the Weekly What Bird, even though I have missed it for a couple weeks before this because of the Churchill trip. I don't have time to make it automatically post on Wednesday, so I'll just miss it this week. When I saw it, I kind of got really excited. "Mom, can we see the kite?" "Mom, we should contact someone to see exactly where the kite is!" Then Christian Artuso made the blog post on the blog about it, and about how it was nesting. Then I got really excited and we contacted Christian and he agreed to take us to the nest. So in the afternoon we went and saw the magnificent bird. 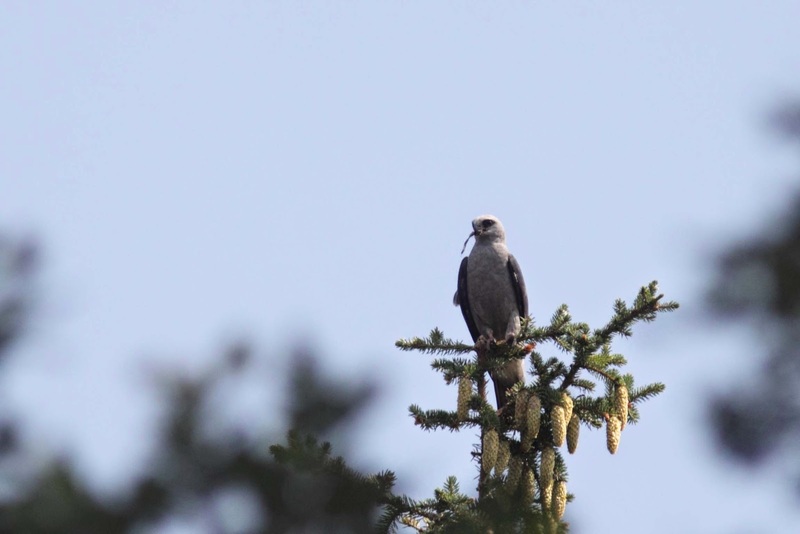 It is actually really funny, when I was obsessed with raptors, I saw in our birds of Canada book that Mississippi Kites are accidentals in Canada. 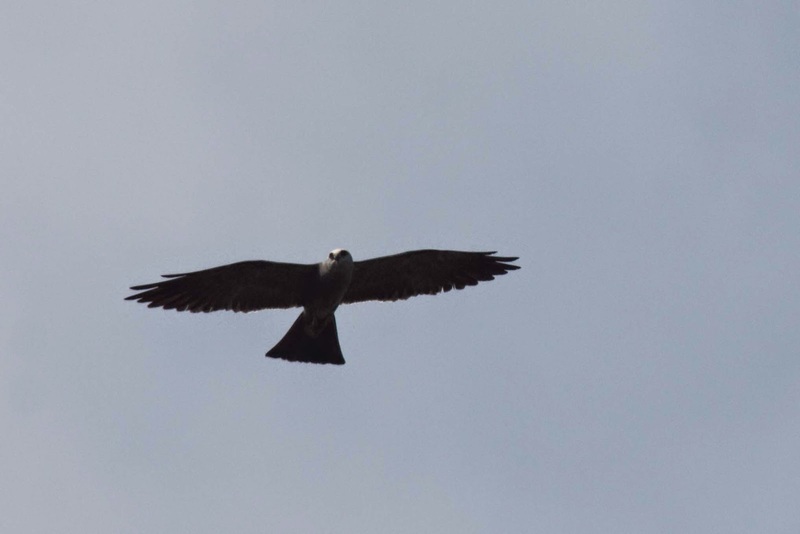 I thought they were such cool looking birds, I said they were my favorite raptor, and now, there is one nesting right in our city! Kites catch dragon flies on the wing, they catch them with there feet. The birds demonstrated this many times while we were there. 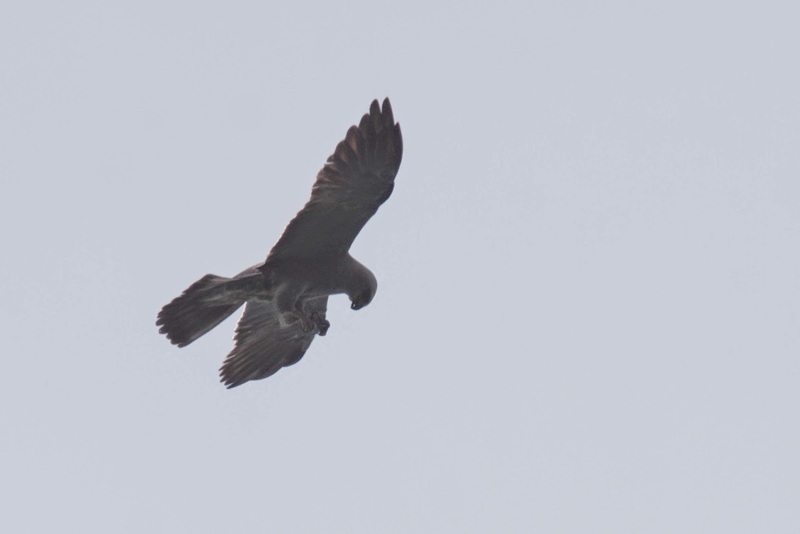 And here is the nest of the kite, you can see a fluffy white ball sticking it's head up, that's the baby! There was a conifer that was a favorite spot for the kites. They kept landing there week after week. Chimney Swifts kept flying over while we were there, a Manitoba Lifer! I will post more picture in a couple weeks, I only have smaller versions of the pictures. Christian sent them over email so he had to make them smaller, he will give us a USB stick with the pictures next time we meet.